Is Jesus the Creator God? Truly, the identity of Christ is of utmost importance. And yet, in today’s culture there are people teaching that Jesus was a created being. Is this even an important question? Absolutely! If Jesus is not God, and therefore the Creator, then He is a created being. If Jesus is created, then how could He have been an adequate sacrifice to atone for sins committed against an infinite God? Jesus must have been God to adequately atone for our sins, which bring upon us unlimited guilt and cause us to deserve an eternal hell. But does it really matter whether or not we believe that Jesus is God? Yes! If one places faith in a false Christ, one that is not described in Scripture, then can this false Christ save them? Truly, the identity of Christ is of utmost importance. And yet, in today’s culture there are people teaching that Jesus was a created being. They are leading people astray. But to the Son He says: “Your throne, O God, is forever and ever; A scepter of righteousness is the scepter of Your Kingdom. You have loved righteousness and hated lawlessness; Therefore God, Your God, has anointed You with the oil of gladness more than Your companions” ( Hebrews 1:8–9 ). We should expect Satan, the adversary of God and the father of lies, to advance many variants of the person of Jesus Christ. Satan would want all the false views to succeed in some measure to lead people away from the true Jesus. One may recall the temptations of Jesus by Satan in the wilderness ( Matthew 4:1–11 ). The great deceiver even attempted to use Scripture to trick Jesus into sinning ( Matthew 4:6 ). The tactic of the serpent in the garden was to deceive the woman by distorting the plain meaning of the Word of God ( Genesis 3:1–6 ). Satan, through the serpent, quoted the words of God and abused their meaning. We must be aware of the devil’s devices ( 1 Corinthians 2:11 ). In [the] beginning the Word was, and the Word was with God, and the Word was a god. This one was in [the] beginning with God. All things came into existence through him, and apart from him not even one thing came into existence (John 1:1–3 NWT). According to the Jehovah’s Witnesses’ theology, Jesus is a being that came into existence. But even their own translation says that apart from Jesus not even one thing came into existence. So then, did Jesus create himself? Of course that is a ridiculous proposition, but you see how Watchtower theology contradicts the Bible, even their New World Translation. These translations show that the Word was God, not “a god.” Why such blatantly different translations and, accordingly, different theologies? One starts with the Bible; the other starts from a false theology and takes that view to the Bible. If God was the Word, as John 1:1 is literally translated, then it is no problem for the Word to have created all things. As God, He created. How could the Word be with God and God be the Word at the same time? The doctrine of the Trinity (One God, three Persons) is the solution here. The Word was with God (the Father) and God (the Son) was the Word. This understanding, consistent with the rest of Scripture, eliminates any contradiction of multiple gods. There is only one God, revealed in a plurality of Persons. The Jehovah’s Witnesses do not have a solution to that alleged contradiction. The primary reason Jehovah’s Witnesses do not want John 1:1 translated accurately is due to influences outside the Bible. 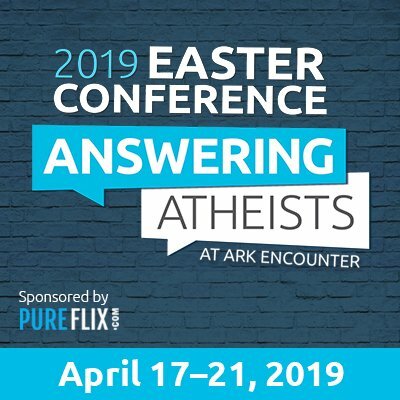 As the theological descendents of their founder Charles Russell, they arrive at the Bible with the preconceived notion that Jesus the Christ is not God. Therefore, when a passage that clearly contradicts their theology comes up, there are two options: change their belief to coincide with what the Bible teaches or change God’s Word to fit with their current theology. Sadly, they have opted to exalt their theology above Jehovah’s Word. So, who is really the Jehovah’s Witnesses’ final authority? It is no longer a perfect God and His Word but fallible, sinful men and their ideas about God. It is very interesting to see how the Jehovah’s Witnesses Greek-English Interlinear translation compares with the NWT and with more accurate translations. One Jehovah’s Witness said that their translation comes from an interlinear translation of the Westcott and Hort text and that the NWT is a good translation of it. But let’s check into the two primary interlinear translations appealed to by Jehovah’s Witnesses: the Kingdom Interlinear and the Emphatic Diaglott. Look carefully at John 1:1. The Interlinear doesn’t translate Theos (θεος) as “a god,” which is an unjustifiable change in the NWT (to the right of the interlinear above). Strangely the interlinear does not capitalize God the second time it occurs, though it does the first. One possible reason they tried distinguishing this particular word for God is due to the spellings of Theos (God) in this passage (θεον, θεος) is due to variant endings. Another variant ending is commonly θεου. who opposes and exalts himself above all that is called God (θεον) or that is worshiped, so that he sits as God (θεου) in the temple of God (θεον), showing himself that he is God (θεος). There is really no obvious reason for the change to “a god” or a lower case “god” by the NWT or Kingdom Interlinear. The interlinear this time incorrectly states that theos is “a god”, but the side translation disagrees and says the Logos was God, instead of “a god.” So again, there are mismatches that make no sense. Trying to appeal to context, the Jehovah’s Witnesses quote part of John 1:18 and John 1:14 while ignoring the teaching of verse 3 which shows Jesus made all things—no exceptions! We have already shown how Jesus can be with God and be God—it is through the concept of the Trinity. Regardless, the context of the chapter should not be neglected. John 1:18 is referring to God the Father as the one no one has seen. Thus, in keeping with the context, we can interpret John 1:18 this way: No one has seen God the Father at any time; the only-begotten God, Jesus—He has revealed the Father. Anytime anyone has ever seen God, he has seen the Logos, the Son, since the Son is the Word—the revealer. So we understand that Jesus reveals God and exists as God at the same time. There is not a contradiction between John 1:1 and John 1:18. In fact, they are amazingly consistent! It should first be noted that all of known manuscripts and fragments of John’s gospel contains this passage without any variation. 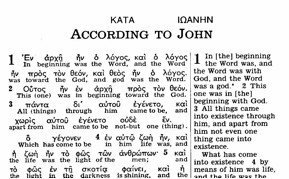 It should also be noted that John 1:1 was quoted on several occasions by early Christian theologians and Church Fathers. . . . Clearly, there is no “ton theos”, [sic] in this text as Al-Kadhi and Deedat claim. Both sentences have the phrase “ton theon”. “Ton theon” is used because it is the accusative case (the nominative case is “ho theos” = “the God”) In this [instance] we must use the accusative case, since the text uses the preposition “pros” which means “with” in this context. But this lets us know how influential the Jehovah’s Witnesses and the NWT are. The NWT is being used in Islam to take people away from Jesus Christ. Leading Jehovah’s Witness apologist Rolf Furuli writes extensively about John 1:1 and how theos should be translated in reference to the Word. He argues for the NWT’s rendering of the Word being “a god” as opposed to “God”. Several of his claims will be discussed here. Perhaps the reason such was not done is that it would destroy the point Mr. Furuli was trying to make. A search of theos in the New Testament shows that theos is overwhelmingly translated as “God” (even when not preceded by an article) unless context warrants otherwise (only about six times). The NT context for John 1:1 overwhelming supports the idea that the Word is God the Creator, as John 1:3 indicates. 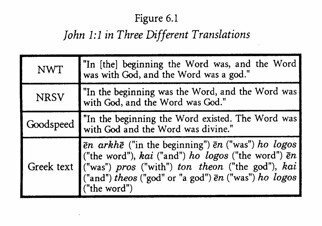 Furuli argues that John 1:1b can be translated: “And a god was the Word,” since there is no article in front of theos, and thus, the context must determine the meaning of theos. In response we can first appreciate the concession that Furuli is making: the lack of the article in front of theos does not mean that the word theos is to be translated as an adjective (divine) or with an indefinite article (a god) rather than simply “God.” (Even if it should be translated as an adjective, the verse would still teach the same thing—the Word is of the same essence as the Father.) It is obvious that there are many times that theos is translated as “God,” referring to Jehovah, even when not preceded by an article. Furuli evidently concedes that. So now it is a matter of context, says Furuli. We agree that context is crucial. But if context is so important, then why not look carefully at John 1:2–18 ? Furuli mentions only John 1:14, “with God” from John 1:2, and John 1:18. Why did he not refer to the other verses, including verse 3, which makes it clear that the Word made all things? Furuli then attacked the eternality of the Word, Jesus Christ. In an attempt to downgrade that “in the beginning was the Word,” Mr. Furuli tries to show that Jesus was not eternal, thus not God. But again, look at the context. If the Word made everything that was made (verse 3), then he must be eternal. If everything that was made (that is, everything that had a beginning) had its beginning through Christ, then it must be the case that the Word never had a beginning; thus, he is eternal. Let’s go one further step in this study. John, the author of the Gospel, did not simply write the account and disappear. On the contrary, he was the only disciple of Christ to live out his life and die of old age. He, like Christ, had disciples of his own, and the two most noted were Polycarp and Ignatius. It makes sense that John would teach his disciples the truth about Jesus Christ and who He was. His interpretation of Theos as “a god,” he claims is so explicit that he wonders why it took so long for people to realize it. Pastor Russell wrote this in 1899 and yet John’s own disciple Ignatius allegedly missed it? This makes little sense. The reason the early Church knew John was speaking of Jesus being God is not just from the Scriptures, which confirm it, but they were taught this by John who was their pastor for many years. Should it be objected that Christ created officially or by delegation, I answer: This is impossible; for, as creation requires absolute and unlimited power, or omnipotence, there can be but one Creator; because it is impossible that there can be two or more Omnipotents, Infinites, or Eternals. It is therefore evident that creation cannot be effected officially, or by delegation, for this would imply a Being conferring the office, and delegating such power; and that the Being to whom it was delegated was a dependent Being; consequently not unoriginated and eternal; but this the nature of creation proves to be absurd. 1. The thing being impossible in itself, because no limited being could produce a work that necessarily requires omnipotence. 2. It is impossible, because, if omnipotence be delegated, he to whom it is delegated had it not before, and he who delegates it ceases to have it, and consequently ceases to be GOD; and the other to whom it was delegated becomes God, because such attributes as those with which he is supposed to be invested are essential to the nature of God. On this supposition God ceases to exist, though infinite and eternal, and another not naturally infinite and eternal becomes such; and thus an infinite and eternal Being ceases to exist, and another infinite and eternal Being is produced in time, and has a beginning, which is absurd. Therefore, as Christ is the Creator, he did not create by delegation, or in any official way. The reality is that John 1:1–3 clearly reveals the deity of Jesus Christ, the Word, being the Creator God. As such it confirms many other passages in Scripture that teach that Christ is God. Early church fathers such as Ignatius, who was a disciple of John the Apostle, also recognized Jesus as God. The significance of this is a matter of salvation. Without the true Jesus, can one really be saved? “The Truth about Angels,” The Watchtower, November 1, 1995, Watch Tower Bible and Tract Society of Pennsylvania, http://www.watchtower.org/library/w/1995/11/1/article_02.htm. Retrieved 9-18-2007. Reasoning from the Scriptures (Watch Tower Bible and Tract Society of Pennsylvania, 1985), p. 150. 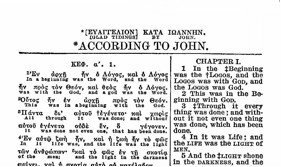 Westcott and Hort Greek New Testament (1881): With Morphology (Bellingham : Logos Research Systems, 2002), S. John 1:1–3. Maurice Robinson, Elzevir Textus Receptus (1624): With Morphology (Bellingham, WA: Logos Research Systems, Inc., 2002), S. John 1:1–3. Jerome, Latin Vulgata, adapted from Online Bible, 2007. The Kingdom Interlinear Translation of the Greek Scriptures (Watch Tower Bible and Tract Society of Pennsylvania and International Bible Students Association, 1985), p. 401. Benjamin Wilson, The Emphatic Diaglott (Brooklyn, NY: International Bible Students Association, Watchtower Bible and Tract Society, 1942). Reasoning from the Scriptures (Watch Tower Bible and Tract Society of Pennsylvania, 1985), p. 416. Dr John Gill, Commentary notes on John 1:18, adapted from Online Bible, 2007. Al-Kadhi, Answering Christianity, http://www.answering-christianity.com/john1_1.htm, Retrieved 9-20-2007. Answering Islam, http://www.answering-islam.org/Responses/Al-Kadhi/r01.2.2.06.html, Retrieved 9-20-2007. Rolf Furuli, The Role of Theology and Bias in Bible Translation with a Special Look at the New World Translation of Jehovah’s Witnesses (Huntington Beach, California: Elihu Books, 1999), p. 200. Ibid., pp. 211–213 (again equating Theos with Elohim to argue against its Greek usage). Ignatius, Epistle of Ignatius to the Ephesians, in The Writings of the Fathers Down to A.D. 325 Ante-Nicene Fathers, Eds. 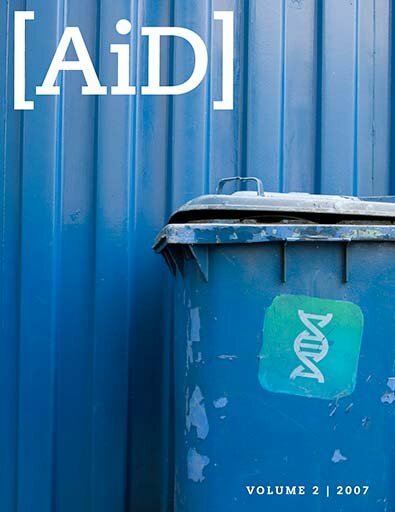 A. Roberts and J. Donaldson (Hendrickson Publishers), 1:49 (Short version). Ibid., p. 52 (Short version). Ibid., p. 56 (Long version). Ibid., p. 57 (Short version). Ibid., p. 57 (Long version). Ibid., p. 52 (Long version). Charles Taze Russell, Studies in the Scriptures, vol. 5, The Atonement Between God and Man (1899), reprinted in Bible Students Congregation of New Brunswick (Edison, New Jersey, 2000), p. 70. Adam Clarke, Commentary notes on Colossians 1:16 , adapted from Online Bible, 2007.